Welcome to Castilian Street Dental Practice! We aim to provide the highest level of care and service to our patients. Our newly renovated practice with state-of-the-art and modern equipment provides quality and ethical dentistry in a caring, relaxed and friendly environment. We offer a variety of services, ranging from general dental care and maintenance to the latest advances in cosmetic dentistry including dental implants, invisible braces and Zoom teeth whitening. We tailor our services to your needs and you will receive the advice you need to make informed choices. Our ethos is centered on prevention as well as cure. We want to help you maintain a healthy mouth and beautiful smile for life! 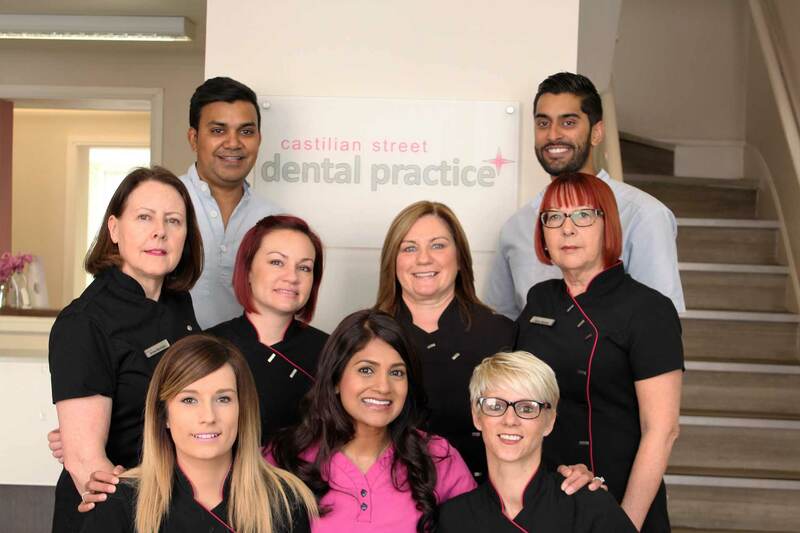 Castilian Street Dental Practice is a contemporary, busy dynamic practice located in the heart of Northampton town centre. It is a well established practice and is now owned by Amar Shah and Sinal Shah. We constantly strive for excellence and pride ourselves on being at the cutting edge of dentistry ensuring all our clients benefit from the latest and best techniques available. We achieved the British Dental Association Good Practice Award in 2011. At Castilian Street Dental Practice we are dedicated to providing our patients with the highest standard of care in a relaxed, welcoming environment. The Practice has been completely renovated and modernised to ensure it is fully compliant with current Care Quality Commission and HTM-0105 (infection control) standards. It is fully computerised and has digital x-rays which allows excellent diagnostic ability. There is air conditioning, state-of-the-art dental chairs with monitors attached for patient education and for viewing x-rays, and Zoom teeth whitening equipment. We believe a visit to the dentist should be a positive experience. The Practice environment is calming and our friendly Reception staff, dental nurses and dentists pride ourselves on our fantastic customer care. We treat all patients as individuals and tailor our services to your needs. Our high standards of care and service ensure that we have a very loyal clientele many of whom refer their friends and family to us. We are always delighted to receive new referrals and guarantee the same outstanding service to new patients that our existing clients have come to expect. The practice also offers alternative private treatments and cosmetic treatments. The dentist can discuss this with you at the examination appointment and provide a detailed quote for you. © Copyright Castilian Street Dental Practice. Website and Hosting by Sublime Media Ltd.
My name is Sinal, and Amar and I are very proud of everything we have achieved in our careers so far. I qualified from Guys, Kings and St Thomas’ Dental School in 2003 and won the University of London Gold Medal. Having always been very driven and also passionate about Dentistry, postgraduate training has allowed me to develop and widen my skill base and has meant I am confidently able to offer patients advanced treatments carried out to a very high standard. I completed the MFGDP(UK) examinations in 2005 and the Diploma in Restorative Dentistry (with a special interest in Periodontology – treatment of the gums) at the Royal College of Surgeons in 2009. I was awarded the Fellowship of the Royal College of Surgeons in 2014, an achievement I am very proud of. I completed the SAAD course in conscious sedation in 2007 which enhanced my ability to treat patients with dental phobias and anxieties. I also enjoy cosmetic dentistry and full mouth make-overs – it is so rewarding seeing patients’ reactions to their new smiles! I completed an Implant Dentistry course at the Eastman Dental Institute in 2012 and offer Nobel Biocare dental implants at the practice. I enjoy straightening teeth via modern orthodontics and carry out Clearsmile aligners, Inman aligners and Six Month Smiles treatments. I honed my Oral Surgery skills in 2013 by attaining an Oral Surgery Certificate from the University of Sheffield. I have also been a Foundation Dentist Trainer for the past 8 years which I absolutely love. My previous trainees nominated me for the ‘Best Young Dentist in the Midlands’ award 2010, for which I was a runner-up. I accompanied one of my trainees to do dental voluntary work at orphanages in Cambodia in 2007 which was one of the best experiences of my life! I have a gorgeous little boy called Zayn who keeps me very busy! I enjoy travelling, reading, eating out and socializing in my spare time. My name is Amah and together with my wife Sinal, we are the Principals of Castilian Street Dental Practice. I qualified from Guys, Kings and St Thomas’ Dental School in 2003. Since then I have undergone extensive postgraduate training to hone and enhance my skills in order to always practice to a very high standard. I completed the MFGDP(UK) examinations in 2006 and the Diploma in Restorative Dentistry (with a special interest in Periodontology – treatment of the gums) at the Royal College of Surgeons in 2010. I attained Fellowship of the Royal College of Surgeons in 2014. I offer invisible braces and Six Month Smiles braces as part of my treatment services. I have a particular interest in making dentures, advanced crown and bridge work and Zoom teeth whitening. I have been a Foundation Dentist Trainer for the past 8 years which is thoroughly satisfying and has led me to attain a Postgraduate Certificate in Clinical Education. The Practice and my little boy Zayn keeps me very busy, but in any spare time that I do have, I enjoy travelling, photography. golf and socializing. We are firm believers that prevention is better than cure and we work closely with all patients to ensure that they receive the best possible advice and care to maintain excellent oral hygiene. We encourage everyone to have regular check-ups. This allows us to closely monitor your oral health, take x-rays when required, and enables us to carry out routine preventative work including the removal of plaque. We routinely carry out general dentistry including silver and white fillings, root canal treatment, tooth extractions, crowns, bridges and the construction of dentures. Band 1: £18.80 includes an examination, diagnosis and advice. If necessary, it also includes X-rays, a scale and polish and planning for further treatment. Band 2: £51.30 includes all treatment covered by Band 1, plus additional treatment, such as fillings, root canal treatment and removing teeth (extractions). Band 3: £222.50 includes all treatment covered by Bands 1 and 2, plus more complex procedures, such as crowns, dentures and bridges. The Principals have both completed a Restorative Diploma enabling them both to be able to offer advanced dental treatment including complex crown and bridgework, veneers, and treatment of severely worn down teeth by means of full-mouth rehabilitation. Bridges are a solution to replacing a missing tooth. There are many designs including modern ‘sticky’ bridges which are very conservative and very effective. Veneers can improve the colour, shape and position of existing teeth. They are made from very thin porcelain and held in place by a strong bond. Extensive tooth surface loss due to excessive grinding of teeth or erosion may require full mouth rehabilitation treatment requiring a combination of fillings, crowns and bridges to restore the aesthetics and function of your teeth. Neglected mouths or those with heavily restored teeth may also require tooth by tooth treatment planning in order to ensure the teeth have long term protection, function and form. Implants are an exciting development for those patients who do not want dentures or bridges. They offer a natural-looking, realistic option and can be used to replace individual missing teeth. The implant itself is a small titanium screw which is gently placed in the jawbone to create a permanent new root. A tooth-coloured crown is then placed over the implant to create a natural-looking tooth. Unlike bridges, work does not need to be carried out on any other surrounding teeth making implants the ideal option for individual missing teeth. Clearsmile aligner invisible braces straighten teeth without anybody else even knowing they’re there. The system consists of a series of mouth-guards which slowly move the teeth into line and are a fantastic conservative alternative to full-mouth veneers. The Inman aligner system and Six Month Smiles system are also available to give you the smile you have always wanted, both discreetly and in a short space of time. This is a great way to remove staining from smoking, tea coffee and red wine, without any risk of damaging your teeth. Described as a ‘jetwash’ for your teeth, it works through the combined power of three things – air, sodium bicarbonate and a jet of water. It can be carried out at the same time as your check-up and you will leave with a beautiful smile! Home Whitening System- For those after the convenience of professional tooth whitening at home, this is the perfect solution. Using bespoke trays made from an impression taken at the surgery, patients simply wear the trays containing the whitening gel for up to two weeks. Having qualified from the University of Manchester in 2011 where I obtained my BDS, I joined Castilian Dental practice and completed my Foundation Training under the South Yorkshire and East Midlands deanery. I have been at the practice ever since and have thoroughly enjoyed my time here. Over the past few years I have obtained membership to the Royal College of Surgeons (Edinburgh) via the MFDS RCS(Ed) qualification and have completed a Postgraduate Certificate in Restorative Dentistry at the Eastman Dental Institute (University College London). I am keen to pursue Implant dentistry in the near future. I enjoy all aspects of Dentistry but specifically cosmetic dentistry and treating nervous patients, where I aim to build their confidence and trust. Away from work my hobbies include Gym, football and socializing with my friends!